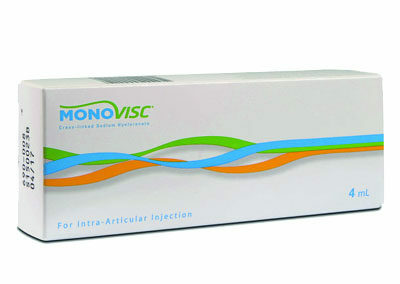 Monovisc is a single injection viscosupplement utilized to treat the joint pain caused by osteoarthritis. Monovisc is highly concentrated, non-animal sourced HA comprised of highly purified, partially cross-linked sodium hyaluronate (NaHA) in a phosphate buffered saline solution, and it is both biocompatible and resorbable. 20mg/mL effective HA concentration.